Cutting Edge Product. Cutting Edge Design. 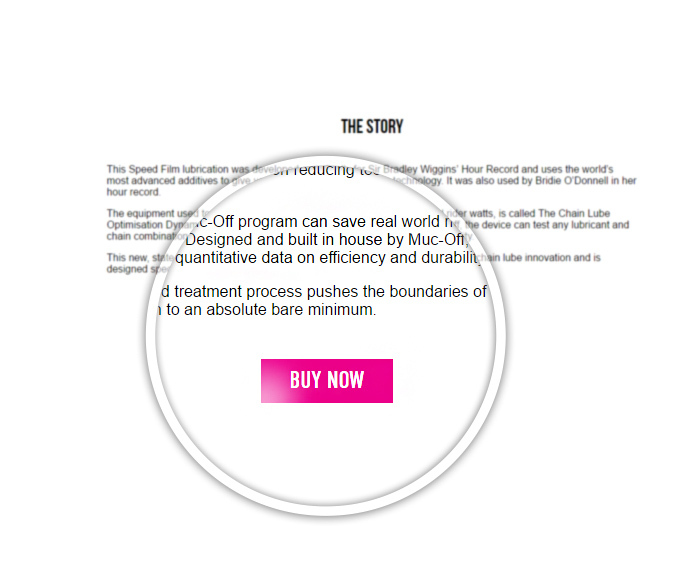 Muc-Off are a client of ours we’re constantly impressed by. They’re a company that puts innovation at the forefront of everything they do and, man, do they do it well. One day they call us to tell us they’ve got a new cleaning product. The next they’re developing a game changing series of athletic performance creams and gels. It’s non-stop, heart-pumping, all-action with these guys. And that’s true of their latest product: the NanoTube Optimised Chain. 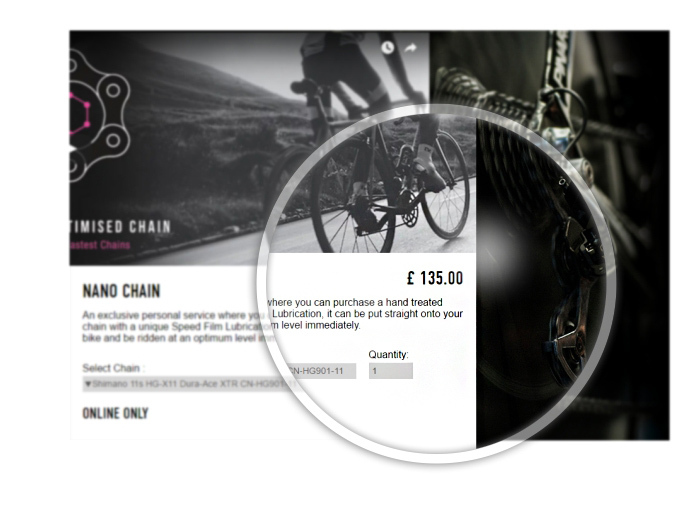 Hand treated with a unique Speed Film lubrication, this ain’t your ordinary bike chain. The nanotube film is an all-weather treatment designed to make the chain incredibly fast, whilst still offering all-weather repellency. Blasting their competitors’ products out of the water, Muc-Off’s product lasts over 400+, with very little performance drop off. The perfect fit for those who have a major race event and want to give themselves that extra edge. Sonic cleaned and applied with nano particles, the process they go through is painstaking and precise. We’ve come to expect nothing less. A product so tight needs a page to match. That’s why we threw the previous template out of the window and created a whole shop front for their Nano Chain. One of the best things about Muc-Off is that they produce some really top quality in-house media. So standardly, we had to bring in the latest product’s promo vid. People love videos. As you know, you just watched the one above. We wanted people to be pumped as soon as they landed on the page, so we made this the first thing they see. The next key element was the price. We wanted the users to know how much it cost straight up. There’s no sales pitch, no over zealous spiel. Just a couple of simple facts and the price. 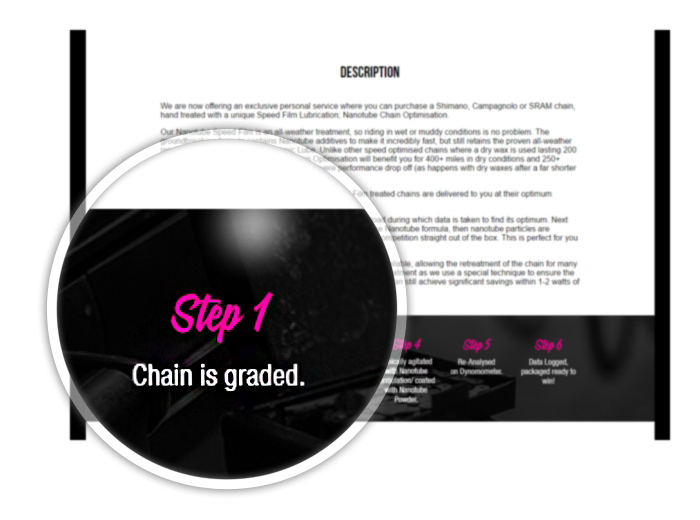 We wanted to let the product and the reputation of Muc-Off speak for themselves. We wanted to make sure the user knew exactly what they could expect from Muc-Off’s delivery and returns policy. Imbuing the website with credibility, it gives the user clear information and the option to learn more. The ‘Instructions Download’ button is a simple little addition, adding value to the page as well as a CTA. Following, we broke up the page with a set of full width images. A simple way to create some breathing space, this also allowed us to demonstrate the manufacturing process behind the product. Seeing Muc-Off’s attention to detail – and the hands that made it – goes someway to showing the value of the chain itself. For those who need a little more convincing, the rest of the page outlines more information concerning the product. 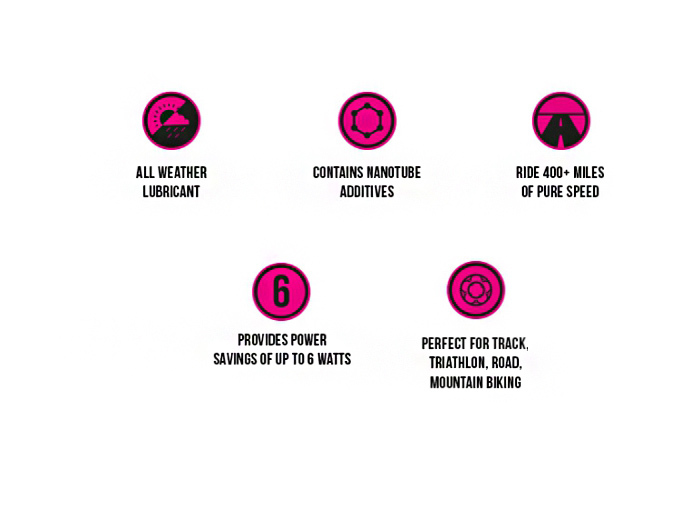 Here we simply list the product benefits using icons in keeping with Muc-Off’s branding. A full description of the product specs follows. We really wanted to get across the amount of effort Muc-Off put in to everything they do. After all, the company are proud of what they’ve achieved and they want people to know about it! Broken down into 6 simple steps, the user gets a sense of what really goes on behind the scenes. All pages must end. And with this one we wanted a final pull to get people to click. By explaining the incredible story behind why the product was developed, we hope to see those on the fence finally swayed into purchase.